I’m a fan of the NHL’s outdoor games, but I feel that the viewing experience for fans in lower seats must be somewhat poor, despite being closest to the rink. If only the rink was sunken into the ground! Well now that there are football stadiums with grass fields that slide outside, that is a possibility. For the large image click here. Here is a design that can translate to any sport with playoffs: the bracket from the background of the All Valley Tournament, seen in the original The Karate Kid. 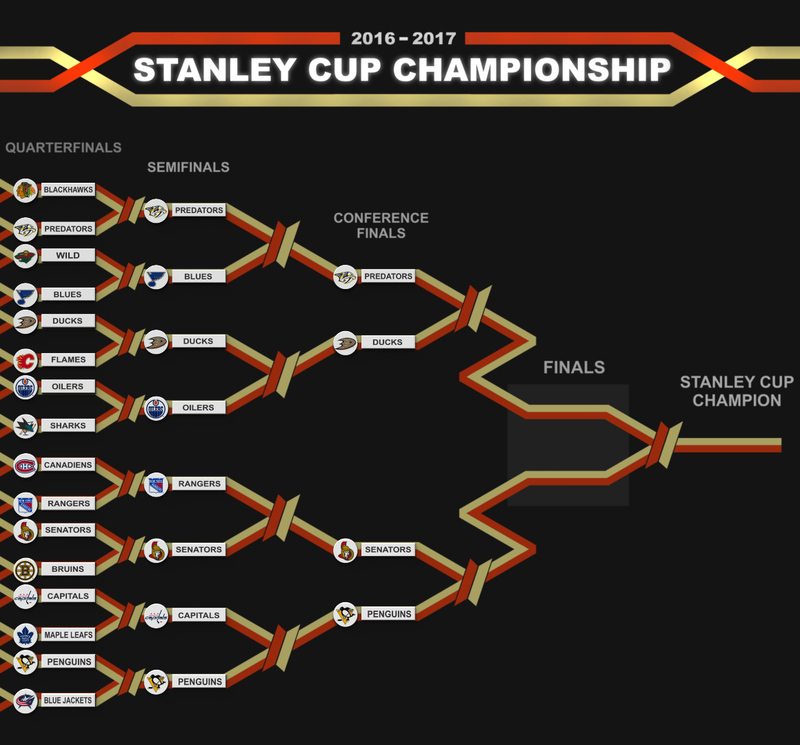 The above depicts the upcoming 2017 NHL Stanley Cup Playoffs. Go Flames Go. This concept for the Calgary Flames is an arena shaped like a stetson hat, thanks to a pair of flanking ramps that usher fans into the upper concourse. How Do These NHL Socks Not Exist? October 17, 2011 March 18, 2014 Categories Fashion, Hockey, Jerseys, Sports2 Comments on How Do These NHL Socks Not Exist? You can buy NHL-branded socks that feature the team colors, logo, and nickname. But what about socks that look just like the ones the players are wearing? No such thing exists! What is even more baffling, is that you don’t need an NHL license to produce these. That is because these designs are simply an arrangement of colors and stripes – no team nicknames or logos. You’d think some company would capitalize on this. I personally would love to throw on some red Calgary Flames socks on game day. Being socks they don’t have much visibility, so I can safely wear these when I am out and about here in Vancouver*. This could also be done with NFL, MLB, NBA and FIFA too. Well, the teams that wear colorful striped socks. Appears to be an endangered species in the NFL, and seldom seen in the NBA or FIFA. Note: This was going to be a part of the Geeky Fashion series, but this is not quite geeky. *When I wear my Flames jersey in Vancouver, I usually end up reminding Canucks fans how many Stanley Cups my team has won (just the one – 1989) with a count of fingers. I don’t use my index finger. Ha.